These delightful little canines average less than 10 pounds and are called papillion (butterfly) because of their large wing-like ears. They accommodate well to apartment living and are good with older children. 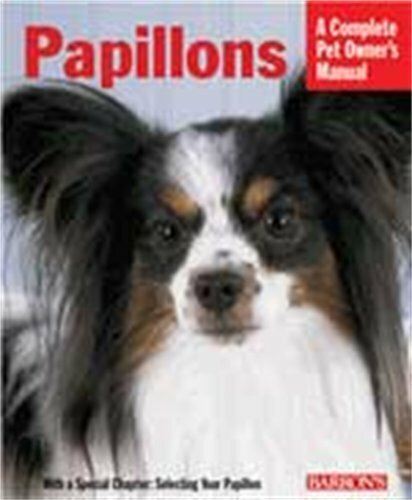 Titles in Barron's wide-ranging and heavily illustrated selection of Complete Pet Owner's Manuals present sound and useful information for pet owners. High-quality photos are in color and line drawings are anatomically accurate. These fact-filled books instruct owners on how to care for dogs, cats, birds, fish, caged pets, reptiles, and virtually every other animal that people are likely to keep as a pet. Books in this series are written by breeders, trainers, veterinarians, and other pet-care specialists. They advise on purchasing, feeding, health care, training, grooming, and all other aspects of responsible pet ownership. These delightful little canines accommodate well to apartment living, and are good with older children.